What Does Code P0214 Mean? Some fuel systems use a separate injector to provide additional fuel during cold starting. This injector is appropriately called a cold start injector. The design of the cold start injector circuit is like that of a regular fuel injector. The cold start injector is turned on by a cold start injector switch and/or the powertrain control module (PCM). When the injector is turned on. a solenoid inside lifts a valve off its seat, allowing the injector to spray fuel. P0214 refers to the 2nd of two cold injectors. What are the common causes of code P0214 ? What are the symptoms of code P0214 ? Symptoms of a failed cold start injector include hard starting, poor fuel economy and increased emissions. How do you troubleshoot code P0214 ? Begin with a visual inspection. Check the cold start injector and wiring and repair as needed. Next, check for technical service bulletins (TSBs) regarding the concern. If no TSBs are found, move forward with a sequential diagnosis of the system. Refer to the manufacturer’s service information for the exact diagnostic process. Test the injector: disconnect the injector connector. With the key and ignition off, connect a digital multimeter set to ohms to each of the injector terminals. Consult the factory repair information for the injector resistance specifications. Autozone offers free online repair manuals for many vehicles under their repair help section (http://www.autozone.com/repairinfo )and All Data DIY offers single vehicle subscriptions. Of course, if your meter reads over limit (OL) there is an open circuit and the injector must be replaced. Check positive side of the circuit: with the ignition on (note: for some vehicles, the ignition switch must be in the “run” position for the injector to get power), use a test light to check for power to the cold start injector. Connect one end of the test light to the battery negative terminal and the other to the B+ terminal on the injector connector. The light should illuminate. If it does not, there is a problem on the power side of the circuit (possibly a blown fuse). Consult the factory wiring diagram and repair the power side of the circuit as necessary. Check the ground side of the circuit: typically, injectors are ground controlled. This means the switch and/or PCM supplies ground to the injector to turn it on. Connect a test light between the battery positive terminal and the injector ground terminal. Crank the engine while cold – the test light should illuminate. If it does not, there is a problem with PCM and/or switch or the wiring to it. 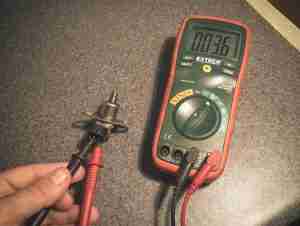 You can check for continuity between the PCM/switch and injector using a digital multimeter set to ohms. Touch one end of the meter to the harness side of the injector connector and the other to the injector ground terminal on the PCM/switch. An over limit reading (OL) on your meter indicates there is an open circuit between the injector and PCM/switch. If, however, you do not get an over limit reading, the PCM/switch is likely the problem. In some cases, the switch can be tested for internal resistance, much like an injector. With the key and ignition off, connect a digital multimeter set to ohms to the appropriate the switch terminals as outlined in the factory repair information. Then, consult the repair information for the switch resistance specifications. None found. Ask a question about P0214.